Quest Nutrition is another nutrition snack foods company, focusing on high protein items. They made protein powder, bars, protein pasta, and even, uh, protein chips and peanut butter cups. The chips sound kinda amazing actually, in real flavors like sour cream and onion, cheddar and sour cream, and more, and 21 grams of protein per single serve bag. Sounds too good to be true, really. I've tried only the bars, as they are an easy grab-n-go item for me when I'm dashing around on weekends. 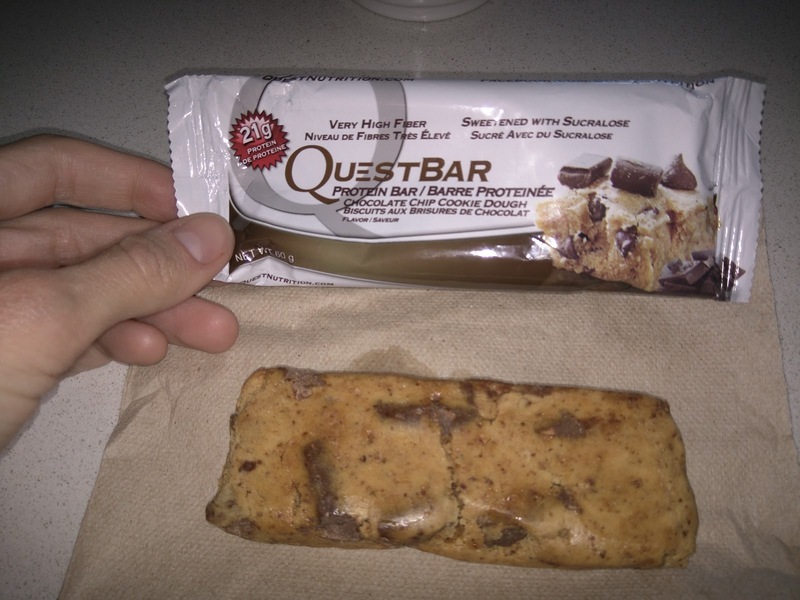 Quest makes 3 different product lines for bars: "Cereal Protein Bars", in flavors like Waffle and Cinnamon Roll, Hero bars, with gooey fillings and sweet candy-like coatings, and more standard protein bars. "America's Favorite Protein Bar leads the charge in Quest's mission to end metabolic disease. Every delicious Quest Bar flavor has 20-21 grams of protein and plenty of fiber without a lot of unnecessary ingredients or extra carbs. 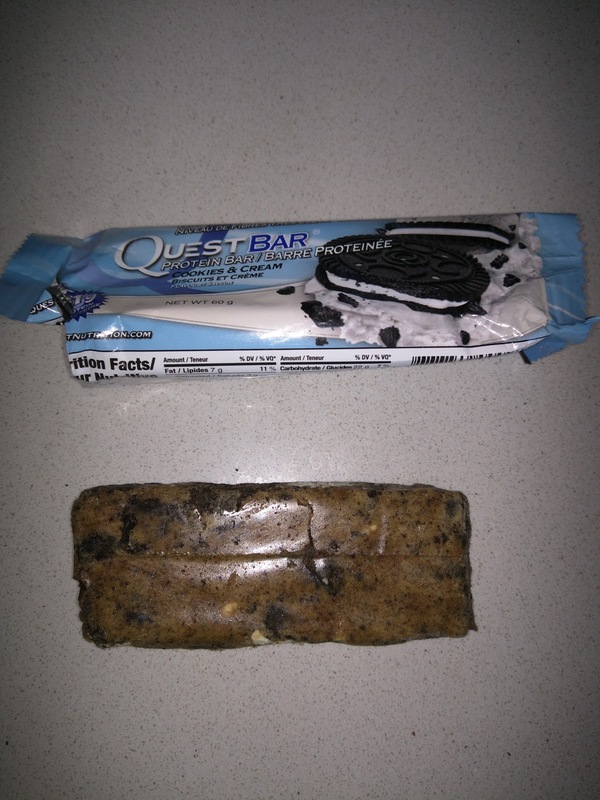 All Quest Bars are gluten and soy free, and contain no added sugar." It is the protein bars that I tried, which is also their most extensive product line, with more than 20 varieties, many of which sound rather awesome (e.g. Strawberry Cheesecake, Cinnamon Roll, PB & J, Mint Chocolate Chunk). The protein bars are high protein, 20+ grams per bar, made from a protein blend of milk protein isolate and whey protein isolate, along with soluble corn fiber, almonds, and, some chemicals. They are virtual no sugar, using artificial sweetener only. Sounds promising, nutritionally, in some ways. I tried several flavors, and, I have to admit, my reaction was a bit unexpected. The texture is all wrong, but, they don't taste that bad. I stopped after trying only 3 varieties however because whey protein isolate bothers my stomach, and, these made me feel awful almost immediately. If you can tolerate whey protein isolate though, I do recommend, for taste and yummy chunks inside! "Toasty-sweet marshmallow, rich chocolate and crisp graham cracker layered together in this melt-in-your-mouth, campfire classic. " This one looked ... promising. I could indeed see large chunks of chocolate. I could indeed see areas of graham cracker. It didn't look THAT fake. And, at first bite, it wasn't awful either. It was kind of a strange texture, but I loved the big chunk of chocolate. And then ... the aftertaste hit. Wow, it was horrible. I don't know what it was, if it was the "protein blend" or all the artificial sweeteners. Whatever it was, it was truly awful. I actually spit it out. I couldn't handle it, nor could I handle taking a second bite to give it another chance. 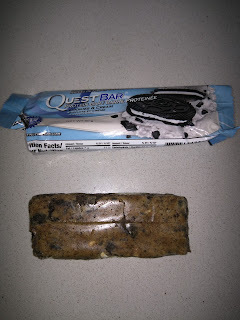 "With real cookie crumbles and delicious cream, America’s favorite flavor can now be your favorite Quest Bar! " So, I tried another, the promising sounding Cookies & Cream. And, like the S'mores, it was actually almost good. The texture was odd, but it had huge chunks of chocolate cookie and cream in it, both of which were actually good. This was much better than the S'mores. Except, well, it had the strange protein blend in it, which immediately made my stomach feel really funny. I need to stop trying these bars! "Our best-selling bar is like sneaking a spoonful of cookie dough straight from the bowl." I don't listen to my own advice. Particularly when I discover cookie dough bars. It was like every other bar. The texture is strange, the taste is strange, but, the chocolate chunks and slightly cookie dough nature of it are good. And it makes my stomach feel strange. I visit the northeast United States several times a year, for several reasons. The primary reason of course is family: my parents live in New Hampshire and Ojan's live near Boston. But I'm not going to lie and say it is *just* to see them. In July or August, my visits are also sorta motivated by the desire to have some actual summer. And a major part of summer? Ice cream, duh. It is no secret that I have a major weakness for the stuff. I didn't grow up in the Boston area though, so I was not familiar with J.P. Licks until I met Ojan. But once I did, J.P. Licks quickly rose to top of my reasons to visit the east coast. J.P. Licks is a chain of ice cream and froyo shops, located all around the Boston area. They currently have 12 stores, 2 of which are very close by Ojan's parent's house, so I plan at least one outing nearly every time I go to visit them. The J.P. in the name stands for their original location, in Jamaica Plain, an area of Boston (nope, they didn't name the place after me, sorry). The focus is ice cream and frozen yogurt, all of which is homemade, but they also roast their own coffee, and serve some baked goods. I know, can it get any better than this? All things I love. The ice cream is hard serve, and they make regular ice cream, plus dairy free versions (soy, coconut, and hemp milk are all used), and sorbet and sherbet. The frozen yogurt is mostly soft serve. For hard serve, they offer a base set of flavors at all times, and then add on ~10 new flavors every month. The soft serve rotates weekly. They also have a slew of toppings, many homemade. I really love the soft serve frozen yogurt, and they make the best peanut butter soft serve frozen yogurt I've ever had. A warning though, the place is expensive. When I visit my family in New Hampshire, our ice cream cones cost $1.50 at one place in town, and $1.75 at Dairy Twirl, my favorite. 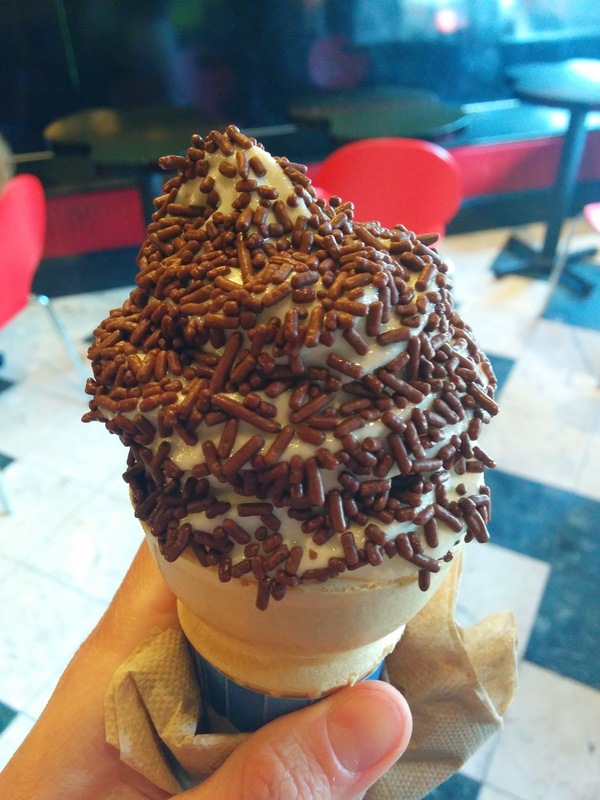 At J.P. Licks, a kiddie cone costs $3.50. On the plus side, they always offer sprinkles for free, and, well, I love my sprinkles. They are also generous with, and encourage, samples before you decide. If you find yourself in the Boston area, I recommend. I've decided that with the soft serve, which J.P. Licks you visit makes a big difference. Charles Street in Beacon Hill is consistently the worst. Icy froyo. Sad Julie. The Wellesley location on the other hand has high quality product, and ridiculously friendly staff. Same with Newton. Going forward, I'll include location information in each update review. Each store has a different number of soft serve machines, generally ~8 flavors. They rotate weekly, and vary by location. The soft serve calendar is published online so you can choose your destination based on flavors. You know, if you are the type of person who does that kind of thing. They offer 3 styles of yogurt: regular, tart (known as X), and No Sugar Added (NS). No, I don't understand the X either. I've tried ... all of them? Below is a compilation of tasting notes. Peanut butter remains my favorite, particularly when paired with chocolate sprinkles. 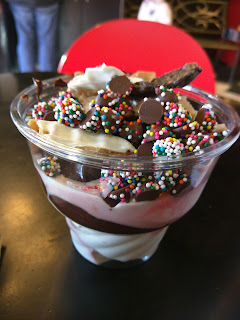 Peanut Butter Froyo, Chocolate sprinkles (kiddie) $3.50. This is my default order. I love peanut butter, and J.P. Licks always has good peanut flavor, and the soft serve is quite creamy. I think the peanut butter has the best consistency of all their flavors, likely due to the added fats? I always add chocolate sprinkles (free!) because I love sprinkles, and I think the peanut butter and chocolate combo is a good one. I also always go for a kiddie, which, varies widely in size. This was a fairly wimpy kiddie cone, and not particularly photo worthy. Expensive for $3.50, particularly when you compare to places like those in my hometown such as Dairy Twirl, where the smallest size, half-small, is $2.50 and much bigger, or even more dramatically, Ice Cream Fore-U, with the baby cone is only $1.50 and again, larger. Peanut Butter Soft Serve / Nano Black Soft Serve / Rainbow Sprinkles. Cone. Kiddie. (July 2017, Charles Street). $3.96. Another example of a cone, this time, with two flavors, which J.P. Licks let you do with no problem, layering one on top of the other. I adore JP Lick's peanut butter flavor normally, but I wanted more than just one flavor. The other flavors available (tart, grapefruit X, peppermint) did not seem like good combinations, and I didn't want chocolate or simple vanilla, so, nano black it was! Plus, I liked it before. This time however ... it was gritty. It was icy. It was really not good. Was it the Charles Street machine? They seem to have icy froyo far more than anywhere else. Or is the charcoal actually gritty? I don't know. I just know that I ended up scraping it off, as I just really didn't like it. The peanut butter however was great. Creamy, great peanut butter flavor, although a bit strangely sour. Still, good, and I'm glad I had it. This was a kiddie cone, larger than the one above, but at nearly $4 it really seemed expensive ... again, the places I go around New Hampshire are literally more than half the price! Black and White Malted: This sorta seemed like a malty version of cookies and cream? Not bad but not particularly interesting. Caramel: No real flavor, just sweet. Chocolate Raspberry: Not much raspberry, same chocolate I don’t like. Cinnamon Latte: Strange bitterness, do not like. Coconut: Creamy, sweet, mild coconut flavor. Ok, but not remarkable. Coffee: Just sweet, creamy, but do not like. Eggnog: Almost too much to have a ton of, great as sample, and good with cone. Tons of flavor, spices. Mint Cookies N Cream: Really great flavor, the reason why I originally really liked J.P. Licks. Came out kinda icy though. Vermont Maple: This was way too sweet. It did have a decent maple flavor, but, it was far, far too sweet. White Russian: Kinda too sweet, but good. Black Current: Tart, ok flavor, but also really sweet. Blueberry: Very tart, blueberry flavor, even visible bits of blueberry. But, too tart for what I wanted. Grapefruit X (Charles St): Crazy tart. In a grapefruit way, in addition to being a tart yogurt. It seriously made me pucker. Which was fine, but, it was also icy. The Charles street location just really doesn't maintain the same consistency. Lychee: Nicely tart, slightly sweet, a bit icy, but quite nice, for a tart yogurt. Peach: Nicely tart, good peach flavor. Hard ice cream makes up the majority of the menu, all housemade. They have about 20 or so flavors all the time, plus an additional 10 or so that change out monthly. The monthly flavors are often seasonal, like Candy Cane around Christmas, and Fresh Peach in the summer. The signature standard flavors are the Cookies 'n' Cream series, available as Peanut Butter Cookies 'n' Cream, Mint Cookies 'n' Cream, and Coffee Cookies 'n' Cream. They also offer a soy, coconut, and hemp flavor every month. I never get hard ice cream when I go to an ice cream shop, because it never seems much different than what I can get at a store and bring home, and a single cone will cost the same as a pint or quart. But, J.P. Licks makes some really interesting flavors, and I do end up getting hard ice cream when I make a sundae (which I do frequently), as the hard ice cream stands up against the hot fudge better (more on this soon). Black raspberry is my favorite. Banana Peanut Butter Ripple: Tasting notes: Slight banana flavor, little bit of peanut butter swirled in. I like banana and peanut butter together, but I wanted the flavors to be more intense. Blueberry Pancakes & Syrup: "Maple ice cream blended with pancakes and wild blueberries." Tasting notes: this tasted vaguely of maple, kinda like waffles, but, I didn't really taste the "pancakes", although the scooper told me it had real pancakes in it. Interesting flavor idea, but, not particularly great. Butter Pecan: "A sweet combination of butter base and brown sugar, loaded with chewy pecans". Tasting notes: Nice chunks pecan, good butter flavor. Carrot Cake: "An autumn favorite! We shred tons of carrots and marinate them with brown sugar, add raisins and walnuts to create this unbelievable flavor." Tasting notes: This had a lot of flavor, was well spiced, and really was loaded up with shreds of carrots. Incredible interpretation of a carrot cake, in an ice cream! Chocolate Peppermint Sorbet: "Dark chocolate sorbet with a light peppermint flavor." Tasting notes: chocolate sorbet with nice peppermint sauce throughout. Would be a good lower fat alternative. 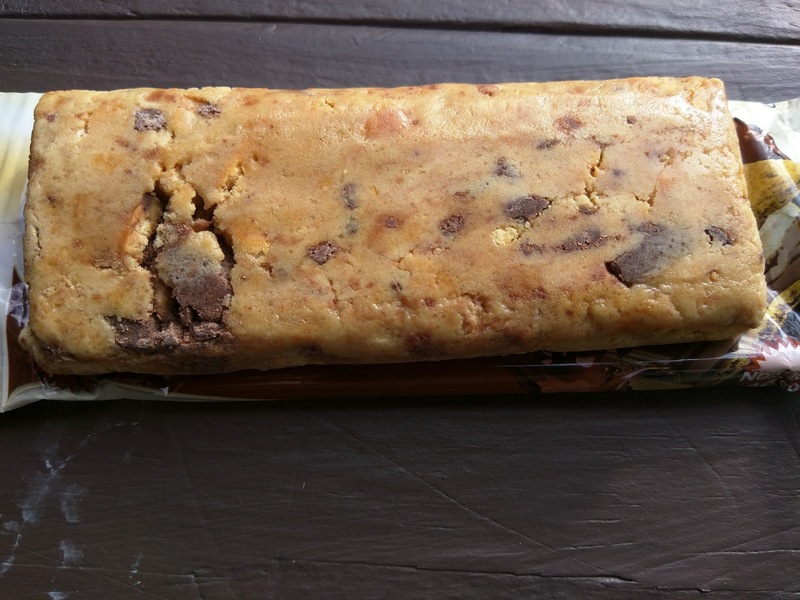 Cookie Dough: Tasting notes: The cookie dough bits were plentiful, but not particularly good, meh. Egg Nog: “Another holiday tradition, Egg Nog ice cream is made with real eggs, a hint of cinnamon, nutmeg and just a splash of rum.” Tasting notes: A tiny bit boozy, not very spiced. Meh. First Night Bananas Foster: “A brand new creation, fashioned after the dessert of caramelized bananas and rum. Sorry, we don't set it on fire.” Tasting notes: Decent banana flavor, not boozy, ok.
Fresh Mint Hard Ice Cream (June Special). "Pounds and pounds of mint leaves are handpicked to create this light and refreshing flavor. ": Tasting Notes: This was really interesting. It was not mint in the way that most mint ice cream is, sweet, and usually with chocolate chips. Nope, this tasted like a mint leaf. It was refreshing. Really different, and the server told me that she always has kids taste it first when they order it, because she's pretty sure they aren't going to actually like it. Fresh Peach: "Fresh, ripe peaches are cut and marinated in a secret brown sugar recipe, then lightly pureed to create a chunky texture that tastes so good, we'll keep it coming all through august!" Tasting notes: Not much flavor, meh. Fruity Pebbles Cereal Milk Hard Ice Cream (July Special). "Fruity Pebbles cereal infused with cream for a sugar cereal taste that will leave you wanting more." Tasting Notes: Yup, this tasted like Fruity Pebbles. Amazingly like Fruity Pebbles. It was sweet, it was fruity, and it was a thing that childhood dreams are made of. But not my dreams. It was what it was, but it wasn't for me. Gingersnap Molasses: "Creamy molasses based ice cream with chunks of gingersnap cookies." Tasting notes: I was shocked by how sweet this was. I expected more ginger flavor as well. Overall, it was tasty, but totally not what I was expecting. Glogg: "A sweet, spicy combination of port wine, brandy, oranges, spices, and raisins, it’s no wonder that we had plenty of volunteers to taste test this deliciously boozy concoction." This was actually pretty tasty. Lots of flavors, and I liked the boozy quality to it, adn the plump, soaked raisins I found in my sample. Mint Chip: Decent minyness, good amount of chocolate chips. Noodle Kugal: "A creamy mixture of sweetened egg noodles blended with butter and brown sugar and spiced with cinnamon and nutmeg." Tasting notes: meh. 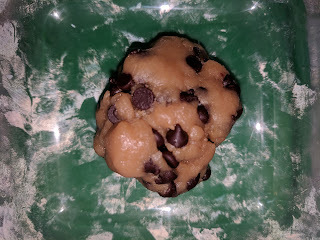 Peanut Butter Cookie Dough Chip: "Delicious peanut butter ice cream loaded with chocolate chip cookie dough and chocolate chips." Tasting notes; ok peanut butter flavor, bits of chocolate chip and cookie dough. Kinda icy though. Pumpkin (SOY): A bit icy, but decent flavor. Pumpkin Cheesecake: "Our famous pumpkin flavor blended with that famous NY cheesecake flavor, finished with those famous graham crackers. Bring this to a party, and you'll be famous, too!" Tasting notes: This was well spiced, slightly pumpkiny, and very cheesecakey. Too rich for what I was in the mood for at the time, but very nice. Salty Caramel: "Rich caramel, made even better with a ripple of sea salt caramel." Tasting notes: The texture of this wasn't very creamy, but the caramel flavor was nice. Not a bad choice, but not my favorite. Sweet Cream: This was pretty plain, as the scooper described it, "Its like vanilla, without the vanilla". It was fine, sweet, creamy, but, not interesting. Perhaps a good base for a sundae. White Chocolate Cranberry Cheesecake: "Pureed cranberries, our famous New York style cheesecake ice cream, together with real graham crackers and white chocolate chips". Tasting notes: nice chunks of cheesecake, but otherwise not that interesting. JP Licks also makes hard frozen yogurt (and sorbet, sherbet, and non-dairy ice cream). The menu has 4 standard flavors (coffee chip, peanut butter chip, oatmeal cookie, and mint chip), and then they add on a monthly flavor as well. "Our low-fat yogurt with red raspberry puree and chocolate chips." I've never been one for hard serve yogurt, but, I decided to give this a try, thinking it might be ok in a sundae, and a lighter option than my regular black raspberry ice cream. It was ... ok. The berry flavor was good, and I liked having chips in it, but, it was icy, and, well, it was yogurt. Meh to yogurt (that isn't soft serve). Small Sundae: Black Raspberry Ice Cream and Candy Cane Ice Cream, Hot Fudge, Walnuts, Almonds, Whipped Cream. $6.50. Since I spend so much money at J.P. Licks, I signed up for their "Cow Card" which allows you to earn rewards for your purchases. It also gives you ... a free sundae for your birthday. And on the anniversary of your cow card. ZOMG. 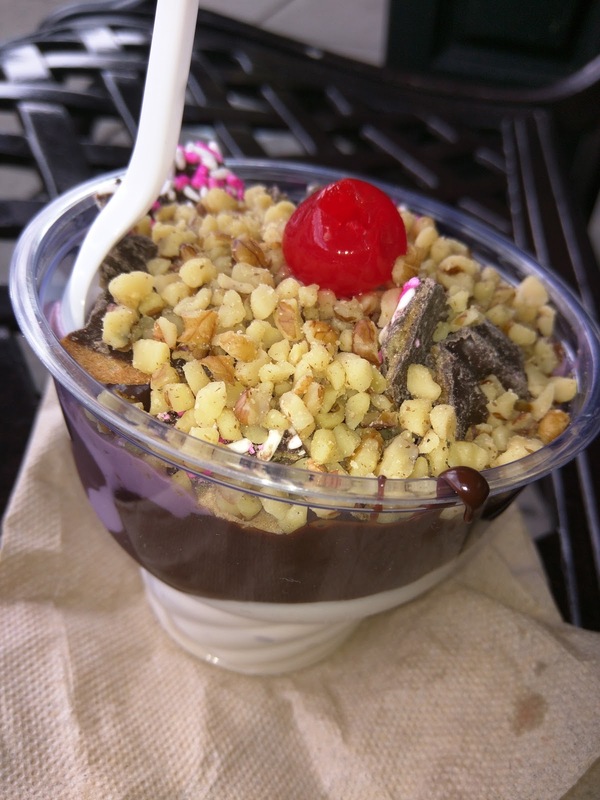 I'd never normally splurge for a sundae ($6.50 for a small! ), but, you know how much I love freebies! For a small sundae, you can pick two flavors of ice cream plus two toppings. It comes standard with whipped cream and a cherry on top. 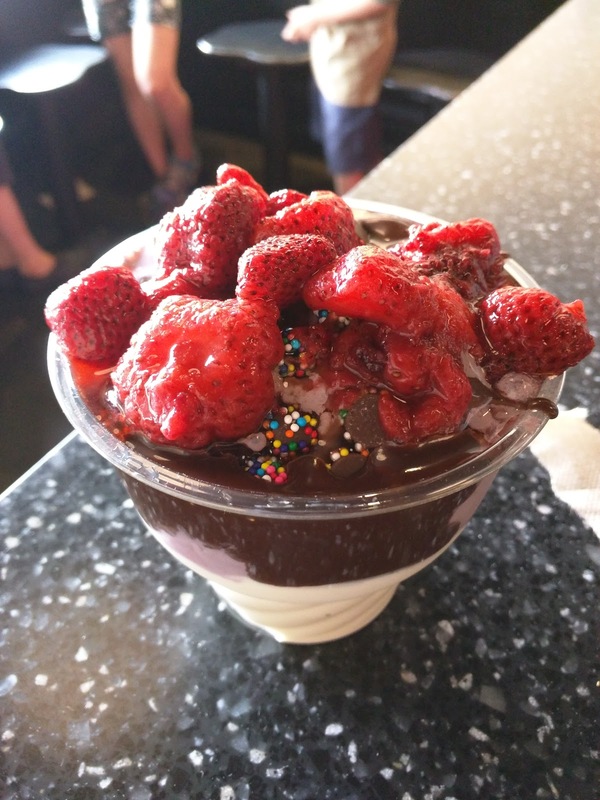 The list of toppings available is extensive, ranging from "wet" items like homemade hot fudge, caramel, butterscotch and marshmallow or berries and other fruits, to "dry" toppings like all sorts of candy. I learned after several visits that you can opt to not have the whipped cream, and pick a third topping instead. I also learned ... many other things. Like the fact that soft serve and hot fudge don't mix very well (it just melts too fast). But that there is no way I can pass up the hot fudge because it is crazy good. 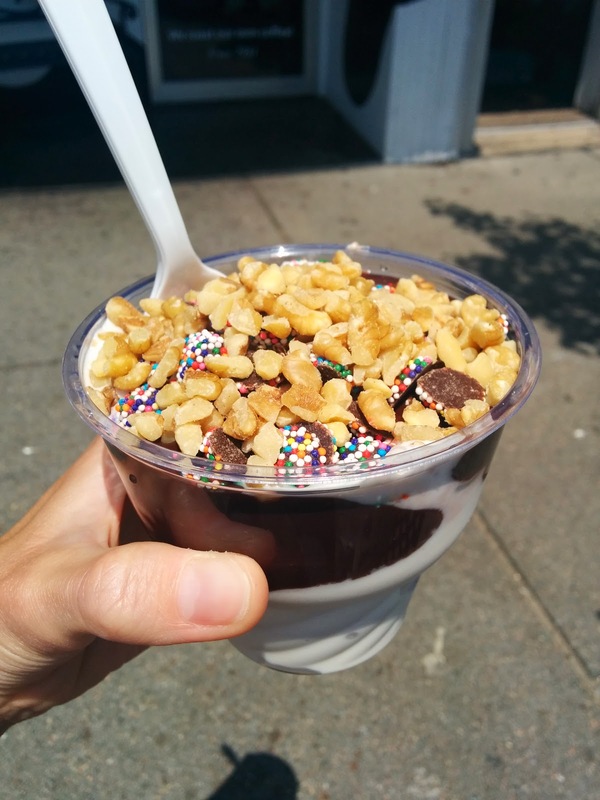 The following is my journey in perfecting the perfect sundae. Which, at this point, I actually believe I have. Small Sundae: Black Raspberry Ice Cream and Soft Serve Peanut Butter Frozen Yogurt, Hot Fudge, Rainbow Nonpareils, Whipped Cream, Cherry. $6.50. 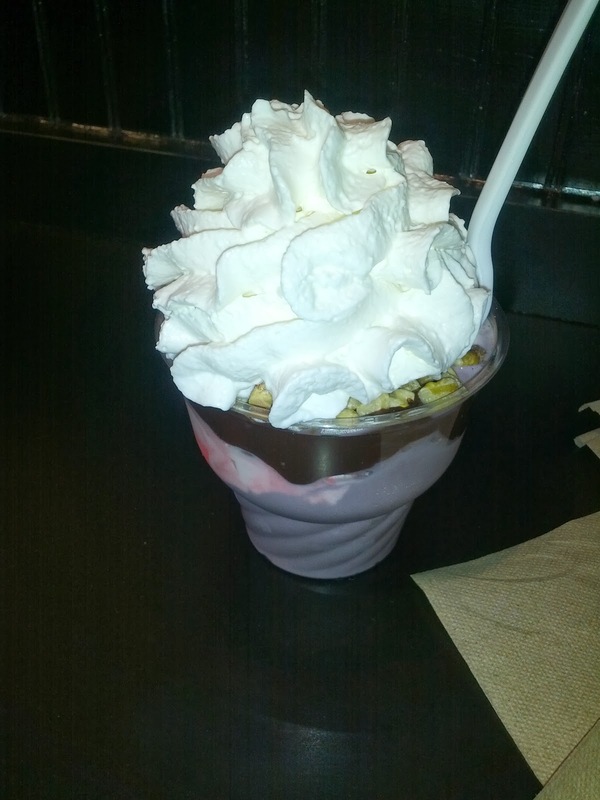 This sundae looked much different from my previous one (pictured above). The amount of ice cream was the same, but the guy who made this one was far more reasonable with the whipped cream. What I love about J.P. Licks is their soft serve frozen yogurt, but, when I've used it in sundaes in the past, it just melts way too fast when the hot fudge is applied. So I was torn. 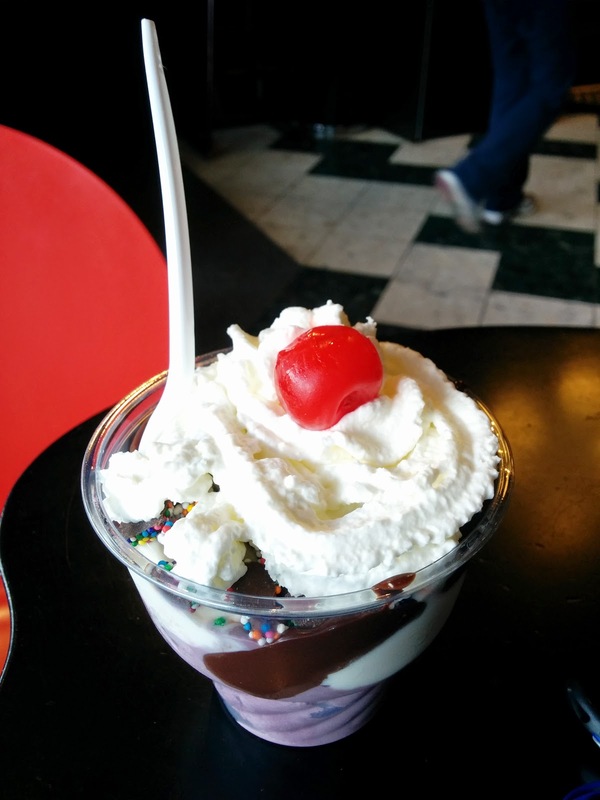 I wanted creamy delicious soft serve, but I also wanted a decadent sundae with hot fudge. As I stood there being a bit indecisive, the server reminded me that I could mix and match multiple flavors AND types of ice cream. Perfect solution! So I picked my two favorites, the black raspberry that I had the first time, and the peanut butter froyo. Perhaps a bit of a strange combination, but I thought it might taste a bit like a pb & j, and both flavors seemed like they would be great with hot fudge. I did make one mistake though, in not asking for the soft serve on the bottom. Thus, the more quickly melting soft serve was on top, and was the one that came in contact with the hot fudge. It melted pretty much immediately. It wasn't a total loss, as it added more creaminess and some slight peanut butter flavor, but I didn't really get to enjoy my peanut butter yogurt. The black raspberry was flavorful and stood up against the rest of the sundae, a great choice. For my toppings, the first was a no-brainer. I adore their hot fudge. Applied hot, it stays soft and fudgey, and they add soo much. On all occasions that I've gotten the hot fudge, I've initially thought it was far too much, and then laughed at myself as I was scraping every last bit off at the end. This time was no different. The nonpareils added the perfect crunch and additional chocolateyness. The whipped cream was again pretty boring, just from a can. I need to remember to just leave that off in the future, and opt for another crunchy topping (like nuts?) or a second sauce. The cherry was, well, a cherry on top. This was a size small sundae, which I could actually imagine sharing. It was a little bit too big for me, but, like I said, I didn't actually have trouble finishing it, and was licking the cup clean at the end. Overall, this was a winner, but I have two final refinements: next time, peanut butter or vanilla froyo on the bottom, black raspberry or seasonal hard ice cream on top, hot fudge, nonpareils, nuts and no whip. Small Sundae: Mint Chip Ice Cream and Soft Serve Peanut Butter Frozen Yogurt, Hot Fudge, Rainbow Nonpareils, Chopped Walnuts. $6.50. I'm narrowing in on the perfect sundae! This time, I took my own advice from last time - see, I don't just write this blog for you, it is great to have for notes to myself! I went for half soft serve and half hard ice cream, stuck with the winning hot fudge and nonpareils, and ditched the whip in favor of nuts. Since I love JP Lick's soft serve frozen yogurt, but I don't want it in contact with the hot fudge since it melts too fast, I asked for the soft serve on bottom. I picked peanut butter, my favorite flavor. I don't normally get the hard ice cream at JP Licks, but for a sundae, it works better. I decided to break out of my mold and get something besides black raspberry, so I went for mint chocolate chip, as I thought it would also go well with the hot fudge. My ice cream/froyo selections achieved exactly the results I wanted: creamy soft serve didn't melt too fast since it was on the bottom, and the ice cream held up against the hot fudge. Peanut butter and mint chocolate chip however was a bit of a strange combo. 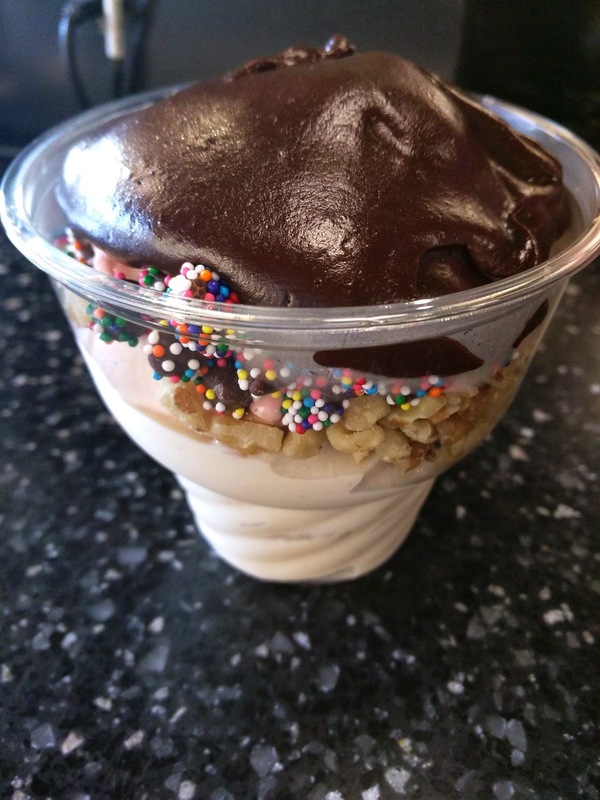 The key ingredient to any JP Licks sundae is their housemade hot fudge. It is just so, so good. Really hot when it is added, so it does melt your ice cream, but it is thick, creamy, rich, just, amazing. I cannot imagine a JP Licks sundae without it. Even as it cools, it is delicious. Since I liked the nonpareils last time for the crunch they added, I stuck with them, and again like them. And since I had repeatedly noted that I should skip the whipped cream, this time I actually did skip it, and was offered any other topping in its place. I went for nuts, to add even more crunch, and uh, some protein? I had the choice of walnuts or almonds, and went for walnuts, since they seemed like they would go well with hot fudge (which, they did). Overall, this was the best sundae I've created so far. The mix of soft serve and hard serve, with soft on the bottom, is certainly the way to go. And this trio of toppings is the best I've found so far too. So, I have just one further refinement: next time, I'll go back to black raspberry (or perhaps another seasonal ice cream). I'm nearing perfection here! Small Sundae: Peanut Butter Frozen Yogurt, Candy Cane Ice Cream, Chopped Walnuts, Chopped Nonpareils, Hot Fudge. $5.95. This time, I thought I had it down. I was going to get vanilla soft serve on the bottom, and my favorite seasonal flavor the Candy Cane hard ice cream on top. The hard ice cream on top would protect the soft serve from the hot fudge, and then I'd get to have both my soft serve and my hard serve, and the flavors would all compliment each other. Except ... the vanilla soft serve machine was broken. I had my heart set on the Candy Cane flavor, since it is only available in December and I love the mintyness, but no other soft serve flavors offered that day were appealing, except my favorite, the peanut butter. I knew peanut butter and candy cane were a strange combination, but ... I had to make a rush decision, so I went for it. I liked the creamy peanut butter soft serve. I liked the minty, refreshing candy cane. And, since it was winter, the ice cream didn't actually melt too fast, so they stayed fairly separate. Not a total flavor strangeness disaster, but, they certainly didn't mix. I again loved the crunch from the nuts and nonpareils. And I adored the flavor of the hot fudge, but this time, it wasn't really hot. Lukewarm at best. As you can see from the photo, it was just glooped on top, rather than melted in like all the other times on the bottom, adjacent to the ice cream. On one hand, this is better, as it didn't melt the ice cream. But ... I like the runnier consistency much more. Anyway, this sundae was one of my least favorite. I actually like ice cream getting a bit melty, which didn't happen because it was cold outside, and the fudge wasn't hot. And, I feel strange saying this since I love the fudge so much, but, there was too much of it. It was hard to get bites of ice cream at first. Next time, back to the game plan: seasonal flavor or black raspberry hard on top, complimentary soft serve on bottom, and the same toppings. Small Sundae: Peanut butter soft serve frozen yogurt, black raspberry ice cream, hot fudge, rainbow nonpareils, strawberries. This time, I went for the soft serve on the bottom, as always. This continues to work well in terms of meltyness, but the peanut butter flavor was far too subtle. Quite disappointing. On top I went for the black raspberry again. I tried a few other hard flavors, but wasn't inspired by any. It was ok, and paired nicely with the hot fudge, but wasn't outstanding. The hard ice cream did hold up nicely with the hot fudge. The hot fudge was thick and chocolately, but it wasn't really hot. This meant that it didn't melt the ice cream, but it also just wasn't as good. I appreciated the crunch from the rainbow nonpareils. I tried a fruit topping for the first time, as I was a bit uninspired when it came to my final topping pick. I didn't want more candy, and I didn't think the sundae could take two sauces. Strawberries seemed like they'd pair the best with the hot fudge. They were awful. Mush. Sweet mush. Clearly not fresh berries, but also not even trying to be a compote. Just frozen strawberries that were then warmed up. Ojan and I were sharing this sundae and decided to just throw them all out. This meant that we sacrificed some precious hot fudge, but, alas, we really did not want them. I skipped the whipped cream since I never really care for it. Overall, really not a good sundae, my least favorite ever. Small Sundae: Vanilla Soft Serve Yogurt, Candy Cane Ice Cream, Hot Fudge, Rainbow Nonpareils, Waffle Cone Pieces. $5.95. I continue to perfect my sundae. The combination of soft serve yogurt on bottom, and hard ice cream on top is clearly the way to do it. It was over Christmas when I visited, so the seasonal Candy Cane flavor was available, which I always love in a sundae, so it was easy to pick my top flavor. My favorite soft serve is peanut butter, but I learned from my past experience that it wouldn't combine well with the Candy Cane. I also liked the Lychee X tart flavor available that day, but again, it seemed like not a good combination. So, vanilla it was. The Candy Cane ice cream was great, minty, and it went nicely with the hot fudge, as anticipated. I loved the additional crunch from the bits of candy cane. The vanilla soft serve yogurt was creamy and tasty as always. Both good choices for the base of the sundae. The hot fudge was ... plentiful. There actually was too much. I ended with a big glob of it left over, no ice cream or other toppings to go with it. No fear, a few minutes later, I just enjoyed it by the spoonful. The fudge is just so ridiculously good. Thick, chocolately, melty ... delicious. The rainbow nonpareils were tasty as always, crunchy little bits, chocolately. Great with the fudge. My final topping was a new experiment: waffle cone pieces, rather than nuts as I usually do. The pieces were a mix of chocolate coated waffle cone pieces, white chocolate waffle cone pieces, and plain waffle cones pieces. I liked the white chocolate pieces the best, but all were good. The chunks were all different sizes, but all were big enough to pick up and scoop up some ice cream (or, just fudge), which I enjoyed doing. Overall, this was a success. I'd pick these flavors of ice cream, and these toppings, again. I still like the combination of nuts and hot fudge, so I missed the nuts, but I liked having the waffle cone pieces to dunk in. I also always love the hot fudge, but I'm curious about the caramel, butterscotch, peanut butter sauce, and marshmallow sauce. So many toppings I want to try! Small Sundae: Peanut Butter Soft Serve Yogurt, Black Raspberry Ice Cream, Hot Fudge, Chopped Walnuts, Assorted Waffle Cone Pieces, Cherry. $6.50. I continue to refine my sundae. It is a given now that I'll leave off the whipped cream, subbing it for an additional topping. As always, I was tempted to try the caramel, the peanut butter, or marshmallow sauce, but, the hot fudge is just too ridiculously good to pass up, so, hot fudge it was. And since I was using hot fudge, i needed to put hard ice cream on top, and soft serve yogurt on the bottom, so it wouldn't melt too fast. I went back to my classic combo of peanut butter soft serve on the bottom and black raspberry ice cream on top. The two flavors combine together decently, and are both ones I generally like. The peanut butter soft serve was good, rich, creamy, and went well with the hot fudge. The black raspberry was really quite good and flavorful, and, also went perfectly with the hot fudge, and melted nicely with it. Overall, successful flavor choices, although, I do wish I could find others that I like more. The hot fudge was as plentiful as always, and, as always, I looked at it and thought I'd never be able to eat that much hot fudge. And, as always, I somehow did, and found myself scraping up every last bit from the sides of the container. The fudge was warm, it was super thick, it was super rich, and I loved how it hardened a bit upon contact with the ice cream. They seriously know how to make hot fudge. My other two toppings are where I always experiment. I discovered the Rainbow Nonpareils many sundaes back, and loved them, so they have been a constant for a while now. Since then, I've alternated my final topping between the various nut choices and waffle cone bits. But this time, I decided to leave off the nonpareils. I do love them, as they are crunchy and delicious, but, with all the fudge, do I really need more chocolate? I picked walnuts, not a nut I necessarily generally want, but, they do go great with the hot fudge. I was provided a very generous portion, and they satisfied all my desires to have something crunchy that the nonpareils normally do. Finally, I went for the waffle cone pieces, a recent discovery. 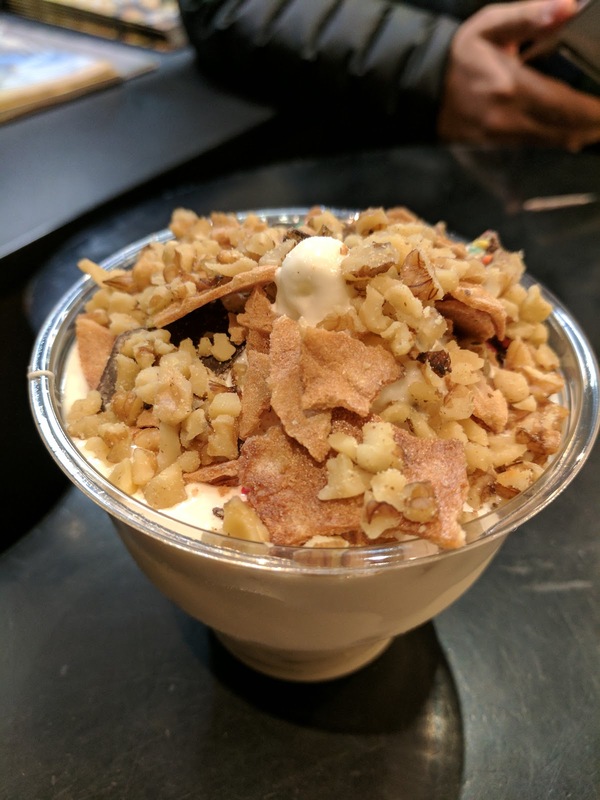 The waffle cone chunks provide a different sort of crunch, and are larger in size, adding some textural interest to the sundae. My pieces came from all different kinds of waffle cones, some plain, but many coated in dark or white chocolate, some with sprinkles or nuts too. These pieces really added so much fun to the sundae, and I liked picking them up with my fingers to scoop up some ice cream too. Even though I didn't get the whipped cream, my scooper offered me a cherry, which I accepted. Why haven't others offered this? It was just a standard maraschino cherry, but, it was tasty coated in hot fudge. Overall, this was a successful sundae. The hot fudge, walnuts, and waffle cone pieces may be my favorite topping combination yet. I did sorta miss the rainbow nonpareils, but, I had enough chocolate and crunch with the other two. I still wish I could come up with a better base ice cream mix, but, I'd get this again. One night, I went to get my free annual ice cream sundae at JP Licks. Because it was nearly 9pm, I was faced with a dilemma: should I break my no chocolate at night rule and get hot fudge? I love, love, love the hot fudge at JP Licks. I decided to use the opportunity to try another sauce, as I wanted to try the caramel, butterscotch, peanut butter sauce, and marshmallow before anyway. This forced me to do it. I had my eyes on butterscotch, but alas, the location I visited did not have it. Caramel or peanut butter sounded great, but then I realized that none of the ice cream flavors I was considering would work with those. Pistachio, black raspberry, mint chip ... those all screamed out for hot fudge. Sigh. Marshmallow seemed like the only more neutral option, even though I wasn't excited about it. Once I realized I was picking a not warm sauce, I decided that I could just get soft serve rather than hard serve, since I no longer had to worry about the hot fudge melting the ice cream too quickly. The soft serve flavors of the week however weren't great. I didn't want mocha, mango, or tart. The maple was far too sweet when I tried a sample. Which left me with peanut butter and vanilla, both flavors I enjoy in a cone, but, not particularly exciting. I still had two toppings to go. My regular rainbow nonpareils were out, as they are dark chocolate. Doh. I still opted to get the waffle cone pieces, even though they have some chocolate. And walnuts, for uh, protein. I'll admit that I wasn't particularly excited about this sundae, even before I tried it. I was sacrificing too many things I wanted, just not to have the hot fudge. The result was about as expected. The vanilla soft serve was a fine base for a sundae, albeit boring, obviously. The peanut butter soft serve I had on the bottom, but it somehow didn't have nearly as much peanut-y flavor as I remembered from past times, it was nearly indistinguishable from vanilla. It turns out that I had tried the marshmallow sauce before. I just didn't remember it, and didn't read my notes first. Doh. From my previous notes: "Marshmallow Sauce: Just sweet, doesn’t go well with soft serve, too much same texture." And ... yup, it was too sweet, and too much the same texture as the soft serve. Very, very sweet, very very gooey. I'm not entirely sure what flavor ice cream I'd want it on, perhaps it would be better when mixed with the hot fudge or another sauce? The waffle cone pieces were still a good choice, crunchy, good sized chunks, and the small amount of chocolate I wasn't too concerned about. The chopped walnuts were also good for crunch. So, overall, just boring, too sweet, and not much flavor. Bad choices on my part. 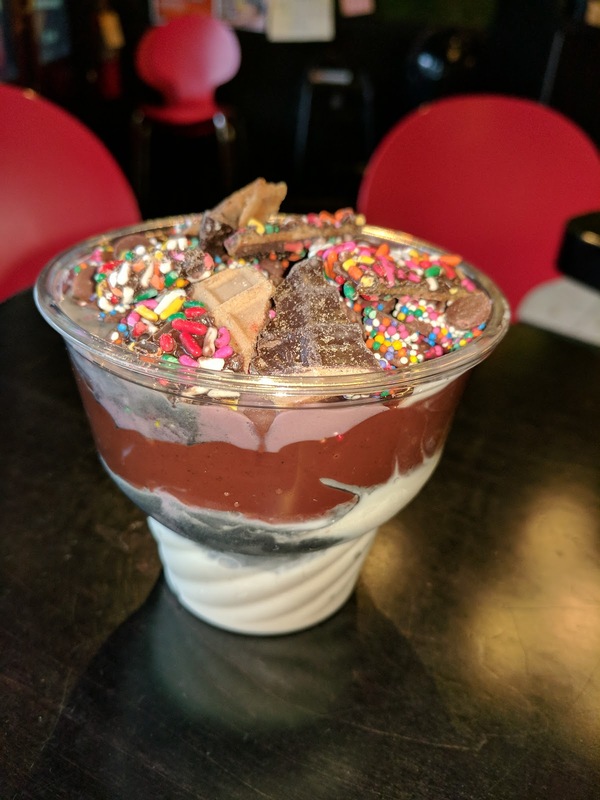 Sundae: Peanut Butter Soft Serve Frozen Yogurt, Nano Black Soft Serve Frozen Yogurt, Black Raspberry Hard Ice Cream, Hot Fudge, Dark Chocolate Nonpareils, Waffle Cone Pieces. Small. $6.50. As always, I continue to have fun innovating on sundae perfection when I redeem my free sundae rewards. On this visit, I was told, "You can pick as many ice cream flavors as you want". I always thought I needed to pick just two. This solves many issues for me, like, wanting two flavors that don't go great together. I could add a separator layer! So that is just what I did. Soft serve Peanut Butter froyo on the bottom, soft serve Nano Black soft serve froyo in the middle, and hard serve Black Raspberry ice cream on top. Three layers, all different colors, light brown, black, and purple. I stuck with hard serve ice cream on top because I knew I'd be adding hot fudge, and soft serve melts too fast. I went for Black Raspberry, since that is my favorite of their hard serve flavors, and it goes great with hot fudge. It was great as always, full of flavor, and yup, went excellent with the hot fudge. Below that, I added the new Nano Black soft serve, a black, activated charcoal flavor. This was a nice, neutral flavor, a bit smokey, soft and creamy. Very good, and a great dividing layer, more interesting than regular vanilla, and, more picture-worthy of course. The base was my favorite of all JP Licks flavors, soft serve Peanut Butter froyo. Full of flavor, soft, creamy, delicious, and, again, a great combo with the chocolate. And about that chocolate. I went overboard on my chocolate toppings. Sundaes are supposed to be one sauce, one dry topping, whipped cream, and a cherry. But I've long since learned that I don't really find much value in the generic canned whipped cream, and that I can sub in any other topping I want. I stuck with ones I knew well: hot fudge, rainbow nonpareils, and assorted waffle cone pieces. JP Licks hot fudge is a thing of wonder. Its really remarkable, home made, insanely chocolatey, thick, served hot, decadent. And they add way too much. Every single time I think of asking for less. I know it is an unreasonable amount of hot fudge. As in, literally, like a cup of it. Way more than any human should eat for health reasons, but also, it kinda takes over. But its just so good I can't bring myself to do it. Next time? The fudge was fantastic. It was hot, it was awesome. As it hardened against the ice cream, it changed the eating experience, but was still great. I always love this, and haven't found another sauce I like more. The rainbow nonpareils I love for their crunch. The dark chocolate is decent quality, and they go great with the fudge. In retrospect though, I think nuts would be a better option, they also add crunch, and also go great with fudge, and wouldn't be quite so much chocolate. Save the nonpareils for when I'm not getting so much other chocolate topping? And finally, waffle cone chunks. The waffle cone topping is an assortment of crushed cones, regular, chocolate dipped, white chocolate dipped, sprinkle coated, etc. I asked for the fun coated ones, and my server had a lot of fun picking them out and arranging them on top. She even offered to just crush a brand new pink one just to make it look better (which I told her was totally unnecessary). I do like having these to dunk into the ice cream, but, actually, I think I'm ready to move on from these. Maybe replace these with nuts? So next time ... 3 flavors, hard on top, two types of soft serve, hot fudge, nuts, and, I really want to try the toasted coconut sometime. Next time. Just some notes on the different toppings I have tried. There are many, many more toppings, mostly fruits and candy, that I have not gone for. Marshmallow Sauce: Just sweet, doesn’t go well with soft serve, too much same texture. Sprinkles: Awesome. Always included for free! Chocolate or rainbow. Very generous servings. Walnuts: Chopped up, love the extra crunch, good with fudge. J.P. Licks also roasts their own coffee, and offers all standard espresso drinks. I know I've tried the regular coffee, but, I never took notes on it. I think it was fine? And, they have a selection of baked goods, mostly muffins and croissants. Since I'm usually there for ice cream, I haven't gone for many of these, but, it seems to make sense with their coffee selections. Corn Muffin: Nice grit, but not much flavor. I'll cut to the chase on this. Yes, I waffle anything and everything. Usually leftovers. I think it is the best way ever to transform day-old foods. Since discovering my obsession passion, people constantly ask me about waffling all sorts of things. I love to engage in these discussions, and run experiments. I get a kick out of it, and have a lot of fun trying crazy things. I often have unexpected success. Or hilarious disasters. Either way, I have fun. 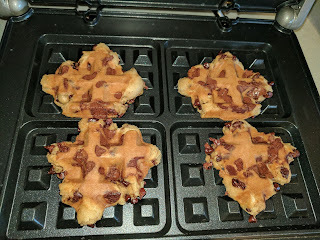 People often don't grasp however that I really use the waffle iron more as a way to reheat foods than to truly "cook", or certainly not to add ingredients to waffle batter. I rarely use raw ingredients ( although I've made quesadillas in it before). I certainly don't try to actually bake in it. 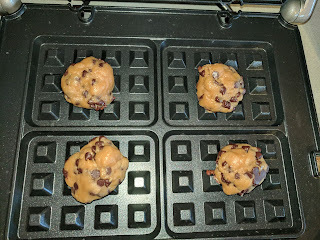 Eventually, someone asked me to cook cookies in the waffle iron. Starting with raw dough. They even provided me the dough. So ... I had to do it, even though this is actually one that lots of people on the internet do. Others have been blogging about it for years. I didn't start here though. It came late in my waffling "career". And, unlike the masses on the internet, I don't recommend it. I evangelize waffle iron cooking, but, not for cookies. It just isn't better that way. So, Cookie Dough: Will it Waffle? Yes, but, just bake your cookies. I started with raw dough, provided by the person who suggested this experiment. He even formed the dough into balls, and brought it to me ready to go. 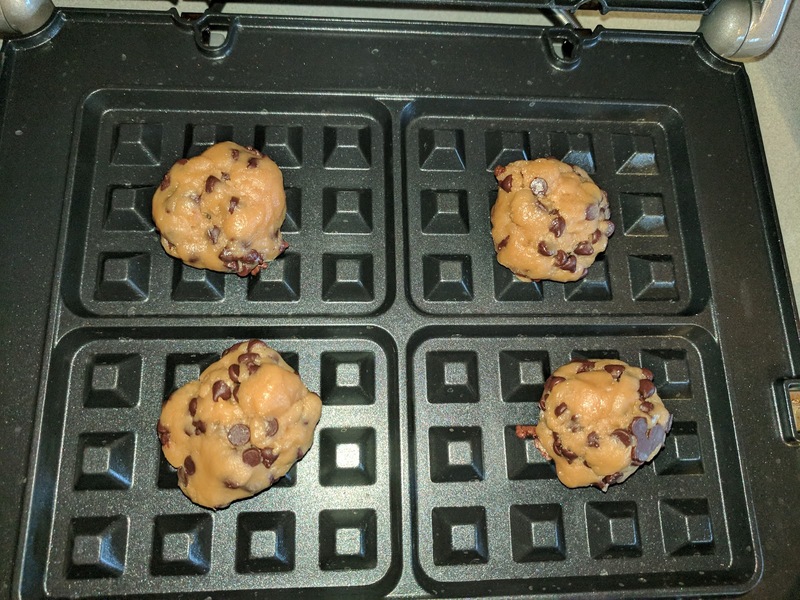 I set the waffle iron to 370°, the regular baking temperature for the cookies, and inserted a ball into each slot. I pressed down the lid. The cookies baked easily. And quickly. They were ready in mere minutes, shorter than regular baking time. They extracted with no problem. 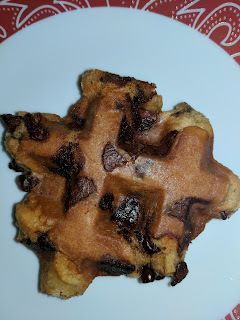 From an ease of waffling perspective, yes, cookie dough waffles like a charm. The result was ... easily identifiable as a waffle. 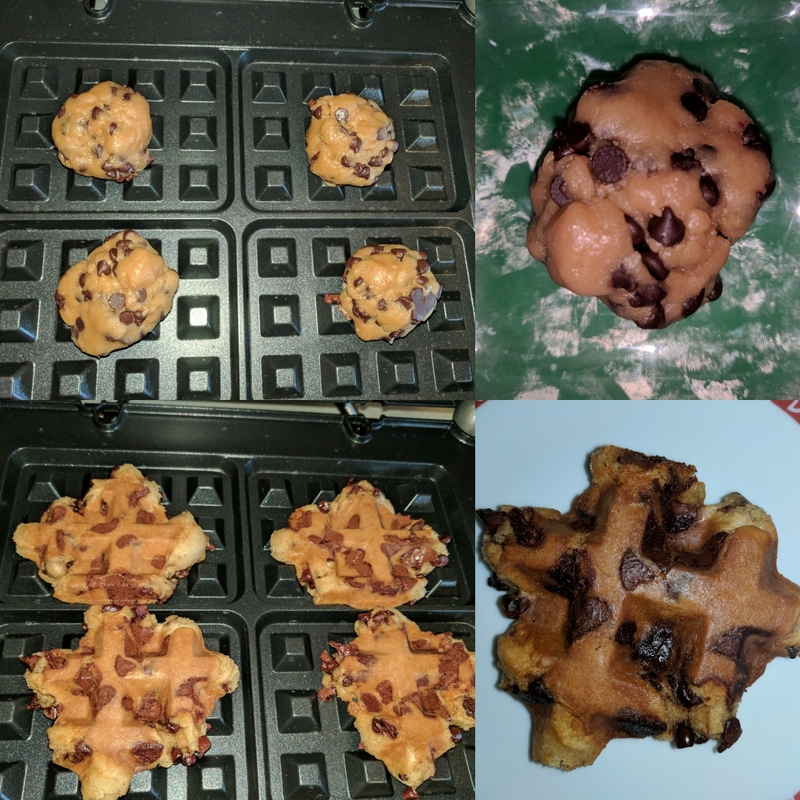 It looked like any old chocolate chip waffle, actually. It was crispy on the outside, cooked through properly. But ... it was just boring. It didn't rise as well as a cookie baked in the oven. It wasn't bad, but waffling it didn't enhance anything, it only took away. I see no real point in cooking cookies this way. 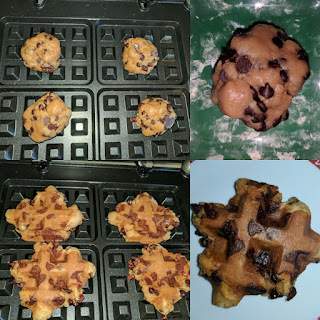 Side note: I do think this technique would work great for ice cream sandwiches, since a waffle-cookie is harder than a regular one, and would hold up to the ice cream better than a traditional cookie. 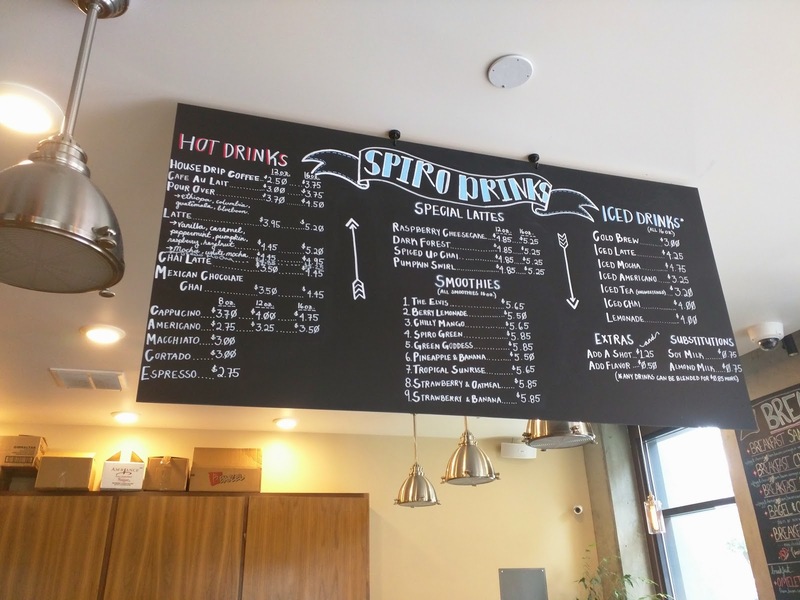 Spiro Coffee was a coffee shop in the Tenderloin, right along Van Ness Ave. I used to walk by it frequently, and finally stopped in a few times to try their baked goods, many of which were baked in house. 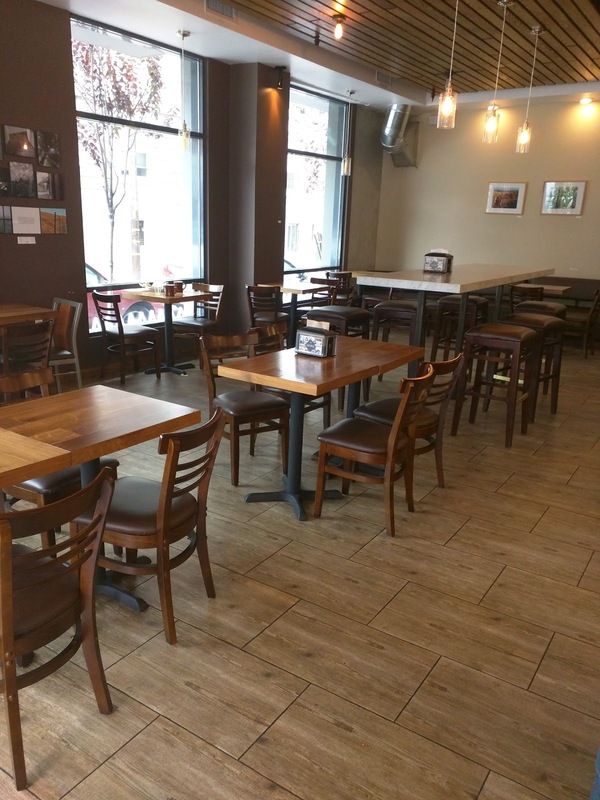 The location was large, service was efficient, coffee good, and the staff quite friendly. Sadly, it has since closed. Not that the neighborhood is one where you'd necessarily want to sit on the sidewalk, but, they had indoor seating only. Simple wooden tables and chairs. Bright and airy inside though, large windows, tables not crammed in. Drink offerings include standard espresso drinks (hot and iced), drip or pour over coffee, chai, smoothies, and even some "Special Lattes" with flavors like raspberry cheesecake. Coffee and espresso come from Sightglass Coffee. I had a decaf once, and remember thinking it was good. Baked Goods: Biscuits, Muffins, Cookies, Scones, Danishes, Croissants. The first display case contained breakfast standard baked goods. Some baked goods are made in-house (biscuits, muffins, cookies), and others come from Bakers of Paris (croissants, danishes, morning buns). Bakers of Paris is wholesale bakery, you can find their stuff at Whole Foods and Safeway too. None of the Bakers of Paris items looked very appealing, besides the scones, but I think that is just because I have a strange thing for mass produced scones, but zero tolerance for lackluster puff pastry. 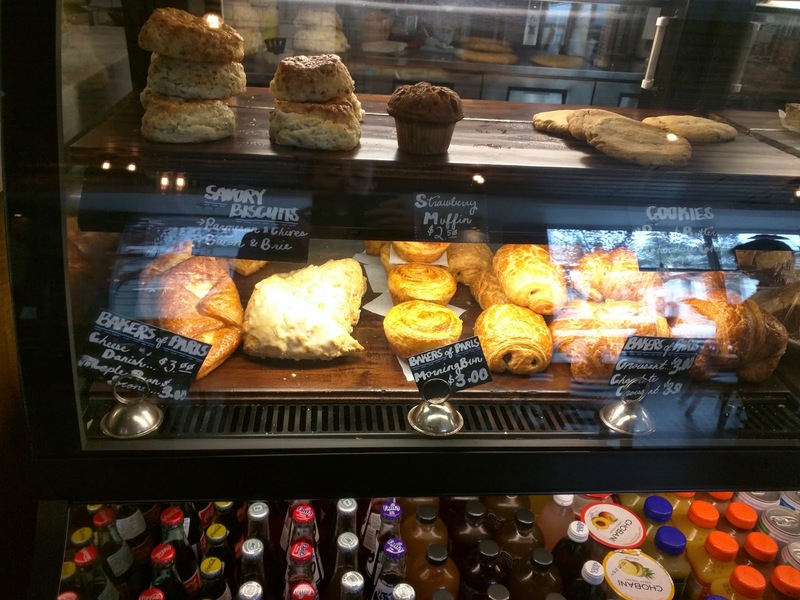 Baked Goods: Gluten Free Offerings, Breakfast Sandwiches. 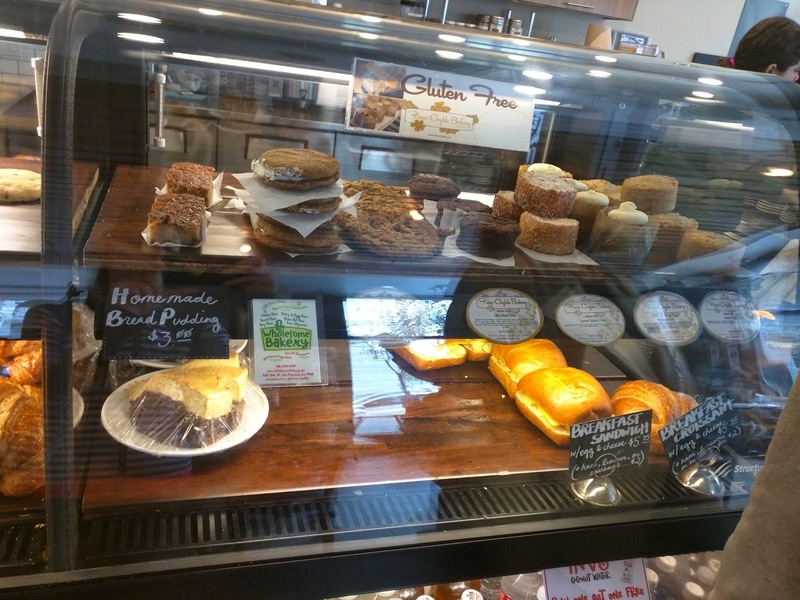 The section section of the case contained more "dessert" style items, like bread pudding and flan (both house made), and breakfast sandwiches. The top shelf was all gluten free, really an impressive selection, with assorted cakes from Flour Chylde Bakery and cookies from Wholesome Bakery. Bacon & Brie Savory Biscuit. $2.75. 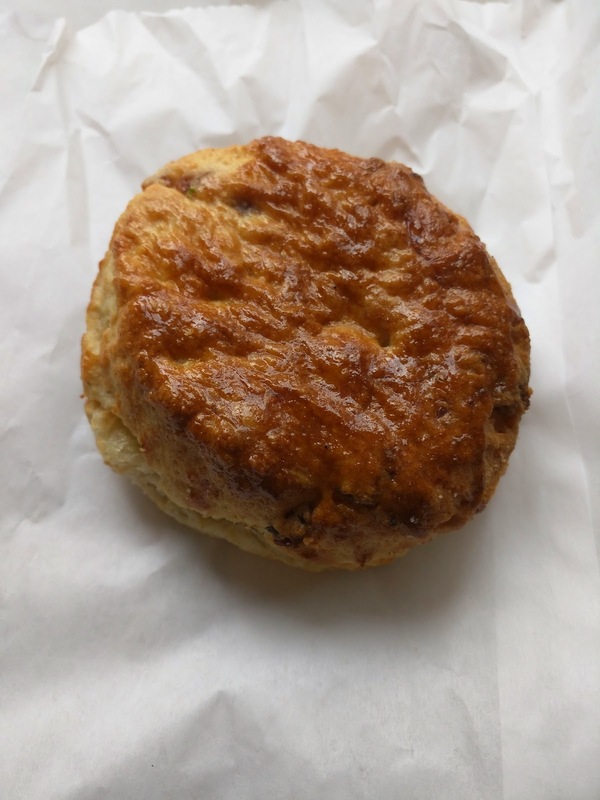 On my first visit, I wanted a house made item, so I went for a biscuit because the muffin really wasn't calling out to me. My choices were Parmesan and Chives or Bacon and Brie. As if that is a question! Brie! I was happy when the server asked if I'd like it warmed up. Of course! Such a nice touch. The biscuit was ... ok. It had a slight tang and decent crumb. I didn't really taste a lot of bacon, and I found absolutely no brie, nor essence of brie, anywhere. It was more oily than I'd like. And ... as for being warm, the outside was slightly warm, but the inside was still stone cold. I appreciated the touch of warming it up, but I think it was even worse in its half-warm half-cold form than if I'd just had it not warmed up at all. $2.75 price was fine, but I won't be getting another one of these. Bakers of Paris Maple Walnut Scone. $3. 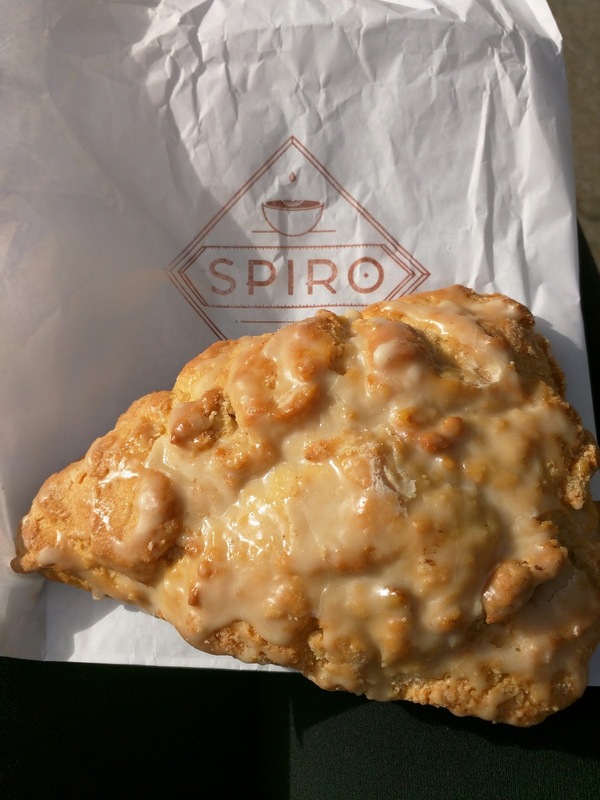 On my next visit, I went for the scone. I couldn't resist. This was a pretty boring scone. It looked so promising, with the glaze on top! The base was rather cakey, not crumbly like I expected the scone to be. It didn't have much flavor nor tang to it. A bit dried out and almost burnt on top. Inside were a few token bits of walnut, nice for crunch, but there weren't many of them. The glaze on top was sweet and subtly maple-y, but wasn't enough to save it. I just wanted this to be ... more. Wouldn't get again.